Elastic TPE constructed, environmental friendly, stretchy for most climbing boot or running shoes. High strength zinc alloy crampons, impact resistant and wear resistant. 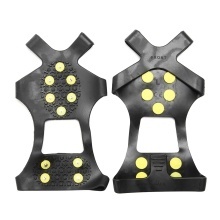 This grippers will make you stable while provide traction on ice, suitable for winter climbing, ice fishermen and those shoveling snow workers. Thermoplastic elastomer TPE, odourless, environmental friendly and cold-resistant can work in -40°C. 10 no-slip zinc alloy studs, impact resistant and wear resistant, providing superior traction and grip on ice and snow. Elastic and flexible to fit well on most sports shoes and climbing boots. Easy to on/off and can fold up to fit in your bag for handy use. Full foot slip protection, designed for snow shoveling, ice fishing and climbing.